Don't be fooled. It's deadlier than "The Ring." 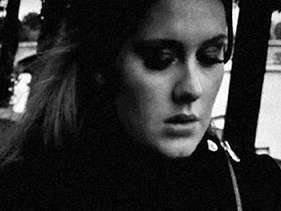 Adele – Yes, she is trying to kill you with heartbreak. She may be close to succeeding with the newly-released video to the haunting and crushing “Someone Like You.” You probably shouldn’t watch this if you want to do anything in the next 24 hours except mope. Beckham, Victoria – The former Spice Girl was unable to hold her child, Harper Seven, for a little while after she was born due to a slipped disc. The injury was suffered either during her C-section or while attempting to hold up her own head. Harris, Crystal – Hugh Hefner’s ex-fiancee is auctioning off her engagement ring, which is expected to sell for $20K-$30K. The adornment has sentimental value for Hef, who remembers the day in his youth that he saw the lump of coal that millions of years later would become the ring’s diamond centerpiece. Osbourne, Jack – Ozzy’s son has announced his engagement to girlfriend Lisa Stelly. Ozzy is reportedly delighted, and can’t wait to eat or snort the young woman. Phillips, Chynna – After Dancing with the Stars judge Carrie Ann Inaba offered Phillips the light criticism that she “played it a little safe,” her dance partner Tony Dovolani said that they would “make love on the dance floor” the next time. The Yugoslavian-born Dovolani is apparently unaware that this is illegal on U.S. network television.